They don’t make many like they make Thomas Ostermeier. That he is not on the tip of the tongue of British theatre-goers says more about the appallingly low number of productions that make it across the channel and the limited tours when if the even get here. An Enemy of the People was sold out for its five performances at the Barbican and I am certain if there was the bravery to finance a small tour then people would come. How can people learn what they like if they never get the chance to see anything different? The glorious thing about watching an Ostermeier production is that while you may not know quite what you will get, you know it will still be a quintessentially Ostermeier affair. For, yes, we are back in the realm of the director as auteur. Cue much huffing and puffing from the comment boards and cue rapturous, and occasionally unthinking, applause from everyone else. An Enemy of the People is the latest to hit the Barbican and follows on from a radical Hamlet that tore down almost every Shakespearian convention and reinvented the play from the grave up. Ostermeier seems to be a man who will be anything but be dull. He brings his own hyperactivity to the text and energises performances far past what audiences should find comfortable; Hamlet clocked in at 168 minutes without an interval, and An Enemy of the People doesn’t fall far short at 150. Yet the quality can be seen that, despite the ridiculous running time, the audience sat in rare rapt attention, with not a rustle or toilet break to be seen disrupting the action. 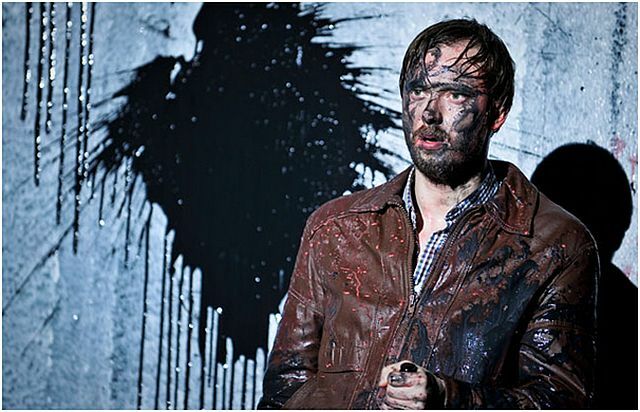 An Enemy of the People is not without flaws and there is a nagging suspicion that Florian Borchmeyer commits serious logical fallacies in trying to bridge his adaptation of Ibsen’s text with a modern element that draws on the anonymous 2007 paper, The Coming Insurrection. However these flaws don’t destroy the integrity of the play and should be placed in the context of the vitality of the production and the creation of a theatrical experience that genuinely led to an enforced, and welcome, assessment of my own political values. That the modern element fails is a shame due to the fact that Ibsen’s own play is so strangely contemporary that it barely needs updating to maintain its resonance. The idea of the small, righteous man standing up against a society that does not want to hear his truth has never gone out of fashion and has grown in stature in recent years, with the Young Vic staging a 1970’s set version last year. 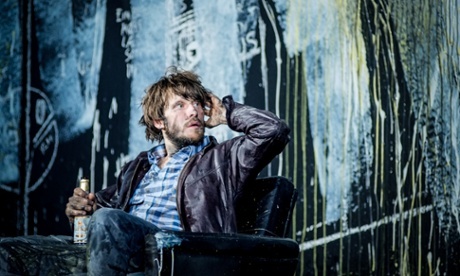 The mastery of Ibsen’s work lies in an apparent simplicity masking serious social complexity. The characters may occasionally present as stock archetypes but in Ibsen’s hands he creates a political morality tale for any age. Each character inhabits a different part of a nuanced standpoint and ultimately we see that Dr Stockmann’s great failing is that his position as a scientist means he cannot understand truth as being anything other than a binary concept. His own egocentricity does not allow him to take on the position of the other, and his great speech taking on the corrupt political elite cannot stop him moving to denigrate those who vote for them. It is a mark of Ibsen’s superlative writing that you cannot see whether, in the final reckoning, he supports Dr Stockmann’s position or not. He is the god author who winds the springs of his characters and lets them go where they will. 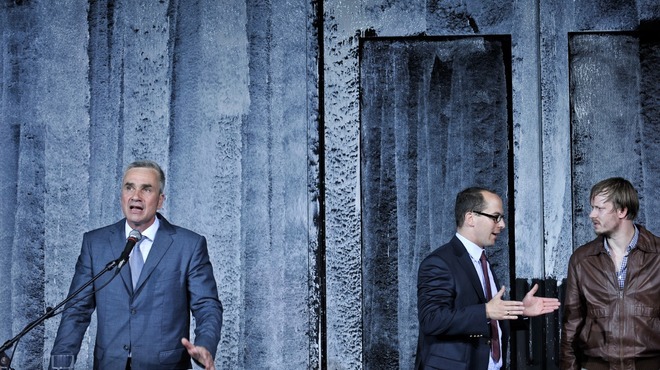 Where Ostermeier’s production fails is that it aligns too clearly against the political elites. The audience are primed to support Stockmann at all costs; the grungy, setting seems very reminiscent of Berlin and its politically active squats, whilst naturally he is a cool, hipster scientist hanging out in a band with his radical journalist friends. His brother, the Mayor, is a natural square dressed constantly in an impeccably pressed suit. It all looks wonderful, is innovatively staged with a set chalked on the walls (which must be a passing nod to Lars Von Trier’s Dogville where Nicole Kidman found herself subjected at the hands of the community) and the acting is superb across the cast. It inhabits the spirit of naturalism whilst clearly embracing Brechtian alienation techniques to force the audience out of the immediate moment. Central to the production is that it demands a response. It will not allow the audience member to sit as passive observer, it forces an intellectual engagement with the themes of the play and it is impossible to exit the play without having been made to establish your own opinions on the subject – and through that a higher understanding of your own political convictions in the modern world. It doesn’t just push at the idea of the ‘fourth wall’, it comprehensively obliterates it. Punchdrunk, DreamSpeakThink and similar companies may play at the idea of blurring the boundaries of the audience-actor dynamic but Ostermeier is willing to destroy the very notion of theatre. It is played entirely straight until mid-way through Stockmann’s famous second-half speech. At which point the play grinds to a halt and the audience is challenged to debate Stockmann’s ideology. The illusion of theatre is snapped and people in the auditorium immediately move from passive receptors to active participants. The transition is outrageously audacious and whilst it is not without precedent it is also something that is incredibly rare to see on a British stage. To hear audience members yell out their opinions with increasing abandon was an invigorating experience. Even if the thoughts were not coherent and the arguments were often simplistic, predictably flecked with left-wing outrage, it gave a glimmer that political culture doesn’t need to be dead. With voices echoing around the auditorium, people protected by the anonymity of the masses, the impression was of a pulsating wave of vocal, inchoate expression slowly growing in power and finding its shape. The play then returns to form and runs to its, slightly tweaked, natural conclusion. The audience leaves and for once the bars surrounding the Barbican are packed. Packed with people discussing, debating, overhearing conversations, joining them, disagreeing, agreeing, compromising, explaining, defending, bonding. If theatre ever wanted to justify its existence as a cultural medium then it could go a long way before it finds an expression of theatre’s immediacy and vitality than this technically flawed but radically brilliant work.